The dreary winter months can be a total bore! 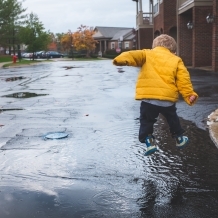 Today we've found 5 rainy day activities that are easy to throw together, won't break the bank and will have your kids laughing and playing for hours! - This Tape Game is both fun and educational. Using tape on your floor in the shape of different letters plus prompting them to 'Bear Crawl to the B' or 'Crab Walk to the C' will have your children moving and learning. - Need a quick fix? Blow up a few balloons and have your children hit it up in the air as many times as possible without letting it touch the ground. Count together and have fun trying to beat their own goals each time! - Are your children fascinated with insects and creepy crawlers? Make a life-size web for them to throw paper 'flies' into and crawl under via this tape game. - Have an indoor scavenger hunt with this printable and keep your little one entertained for hours. - Want someone else to do the hard work for you? Bring your child to Dance Academy and have them laughing, learning and moving while you sit back and relax!